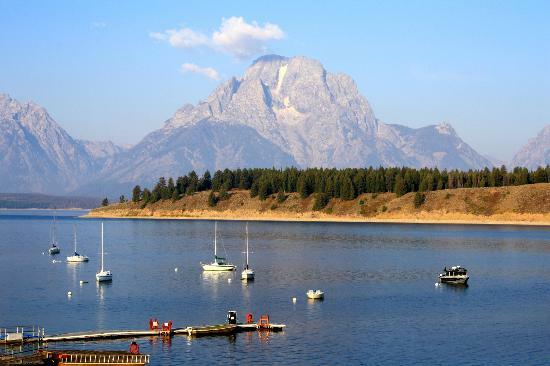 I was born and grew up in Evanston, Wyoming, which is about 180 miles south of the Jackson Hole. Some of my first memories are of family trips to the Tetons—we would make at least one trip to the area every year. I remember standing on top of Signal Mountain and my dad pointing out the mountains to me. The two that dominate the view are the Grand Teton and Mount Moran. Those were the two I could easily identify whenever we visited. Mount Moran from Signal Mountain Lodge. The Skillet Glacier is the obvious glacier in the center of the mountain. The “handle” of the Skillet extends to the summit. In the early days we camped or stayed in a small trailer, but later my parents started a family tradition of renting a place on Jackson Lake at Signal Mountain Lodge. Mount Moran dominates the view and the Skillet Glacier is the most prominent feature from that vantage. My family continued the trips even after my sister and I moved out of the house and started our own families. We would all meet at Signal Mountain Lodge in the summer and spend a few days. In 1985 my wife, Stormy, and I had just started to started to backcountry ski and realize that we could hike up and earn our turns. During the Signal Mountain trip that year I looked up at the Skillet and wondered if anyone had skied it. I did a little research and found that it had been skied. It looks very intimidating, but that’s when I decided I wanted to ski it. At the time it probably wasn’t so much of a desire as the wish that someday I’d be competent enough to ski it. 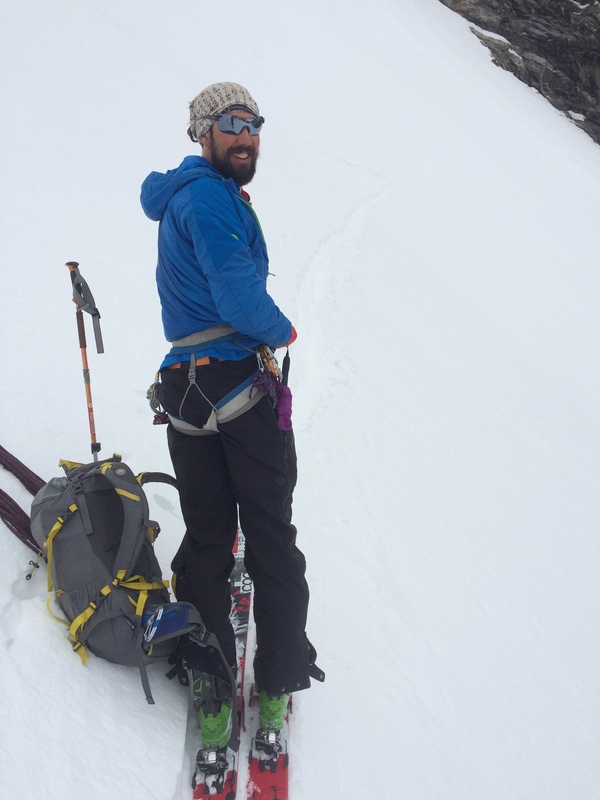 Bootpacking up the 1500-ft handle to the summit of Mt. Moran. Thirty years later I found myself standing at the top of the handle of the Skillet staring down the nearly 50 degree slope. I was cold, but I wasn’t particularly apprehensive. After all, one of our Exum guides, Tim, had me on belay. 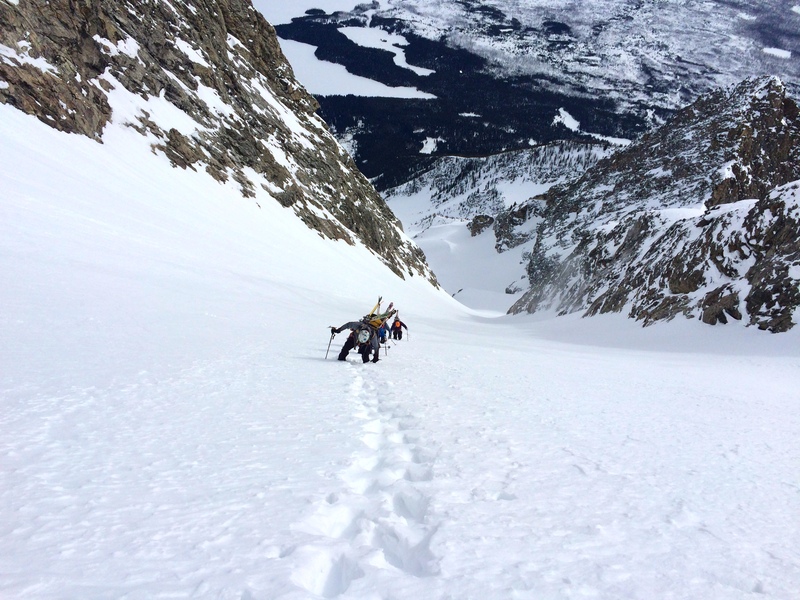 At least I’d be on belay for the first 100 feet of the couloir. And despite having just climbed almost 6000 vertical feet I wasn’t tired. I knew I wasn’t, because our other guide, Brenton, had told me I wasn’t. You see, it seems only Brenton knows if I’m tired or not. Whenever I think I’m tired I just ask Brenton and he assures me I’m not. Brenton assuring me that I’m not tired yet. I won’t say that I skied the Skillet with great technique, but I did ski it along with my other climbing partners Mark, Jeff, and Matt. 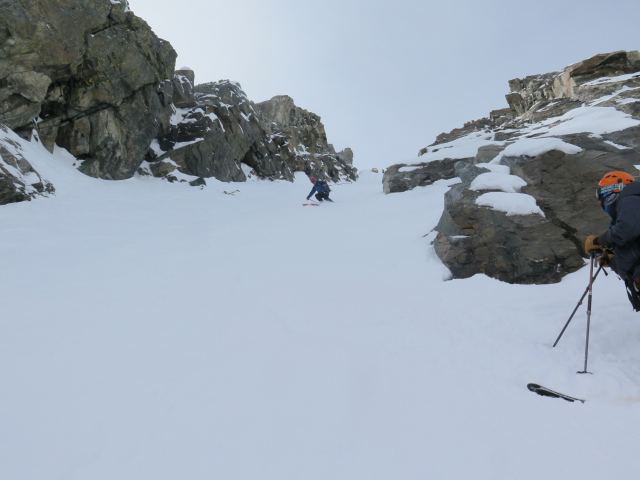 Shane skiing the top of the Handle couloir. Mark at top of the Handle couloir on Mt. Moran. Many thanks to them and our guides Brenton and Tim for helping me realize a dream I’d had for 30 years. It was an amazing trip. Mark gazing back at our tracks on Mount Moran. Here’s a fun video of the entire trip done by one of my skiing partners Jeff Henn. As Barbara Whitten likes to say “wowie zowie”. Shane that is quite an epic couloir! Congrats! 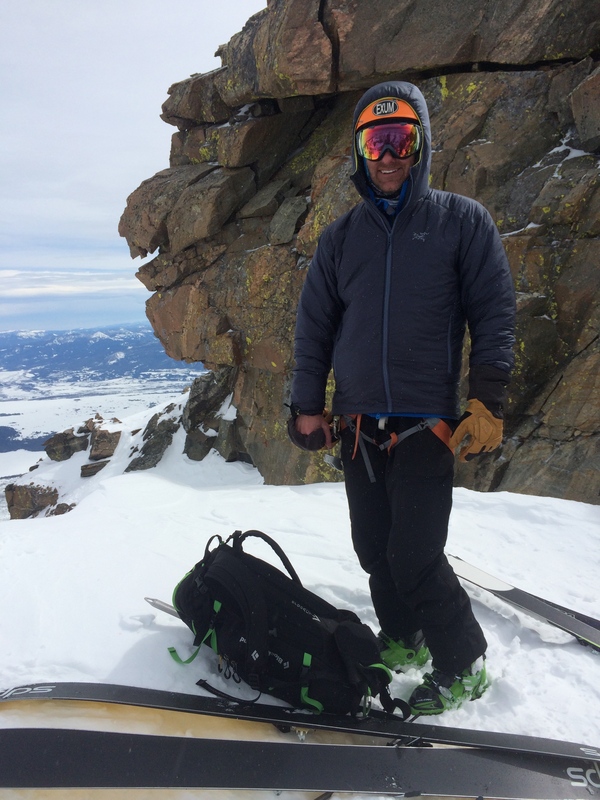 This entry was posted on March 21, 2015 by shane and tagged backcountry skiing, Shane Burns, teton national park, tetons, wyoming.